But what about the old food fads? Is there value in revisiting them? 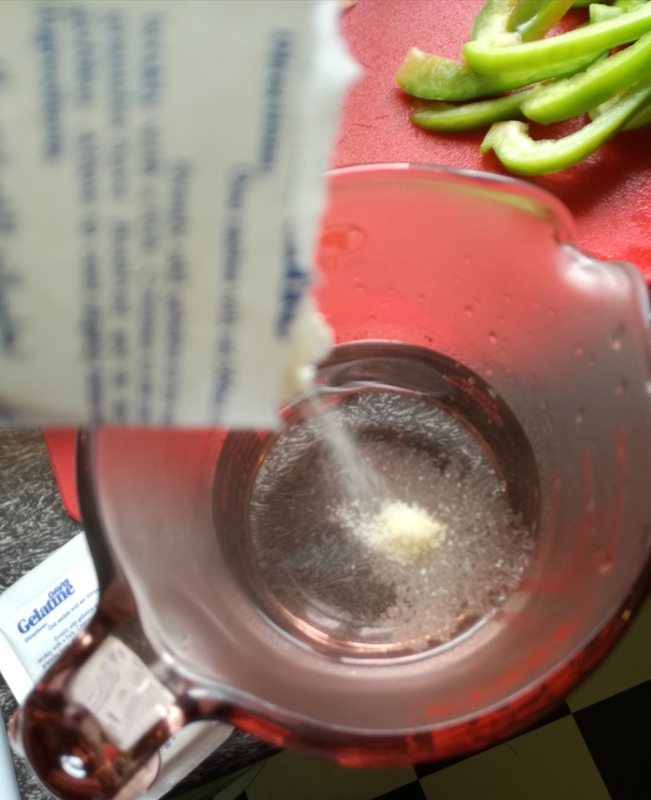 Have our palates shifted; can we stomach the ingredients? ‘Stirring up the stacks’ is a new and occasional blog series coming to you from the kitchens of the Hocken staff. By finding and preparing long-forgotten, curious, or delectable sounding recipes amongst our varied collections, we aim to entertain, inspire, delight or, perhaps, disgust, you with our concoctions. So, let’s get into it! I’ve been perpetually intrigued and grossed out by the concept of jelly salads since I first heard of them. Meat and/or veges, suspended in elaborately shaped goop, and usually photographed with the colour balance all out of whack. Images I’d seen tended to be American in origin, and seemed to date from the 1950s until maybe the 1970s. But meals of jelly had hit the culinary scene far earlier on, here in New Zealand and many other parts of the globe. Emeritus Professor Helen Leach, a well-known face in our reading room, had me nearly fall off my chair in surprise when I read in her 2008 book The pavlova story: a slice of New Zealand’s culinary history, that the first pavlova, dating from 1926, was in fact a layered jelly, with nary an egg white in sight! The Davis company cornered the market, from 1913 producing a gelatine that opened up options in the kitchen. Previously, dishes with gelatine had been the preserve of those with time, resources and great expertise. Evidence indicates that the Davis company promoted their product vigorously. We hold eleven of the recipe books they published in New Zealand, ranging from 1926 through to the 1980s. I browsed through a couple, and quickly realised I was going to need a recipe with an illustration to understand how exactly I was to construct my masterpiece. The book above proved to be a boon. Not only did it have a recipe I thought I might have some chance of executing, it was pictured in full colour on the rear cover. There’s no year of publication, but I suspect it is from the late 1950s or early 1960s – elements of it indicate that it predates decimal currency. My choice of recipe, variety salad, requires me to to make tomato aspic too. For those not in the know, or who (like me) only associate the word aspic with cat food, an aspic is a savoury jelly, traditionally made with meat stock. What better to do than put on some sixties pop and hit the kitchen? You might notice I’ve got both gelatine (Davis brand, naturally), and agar agar powder. Why’s that? I’m (probably foolishly) making two discrete aspics – one for the omnivores and one for the herbivores, of whom I’m one. Curiously, around a quarter of Hocken staff are vegetarian or vegan, and I want a good range of willing tasters – as much as I’m leery of trying it myself. I’ll admit here I cheated a little. 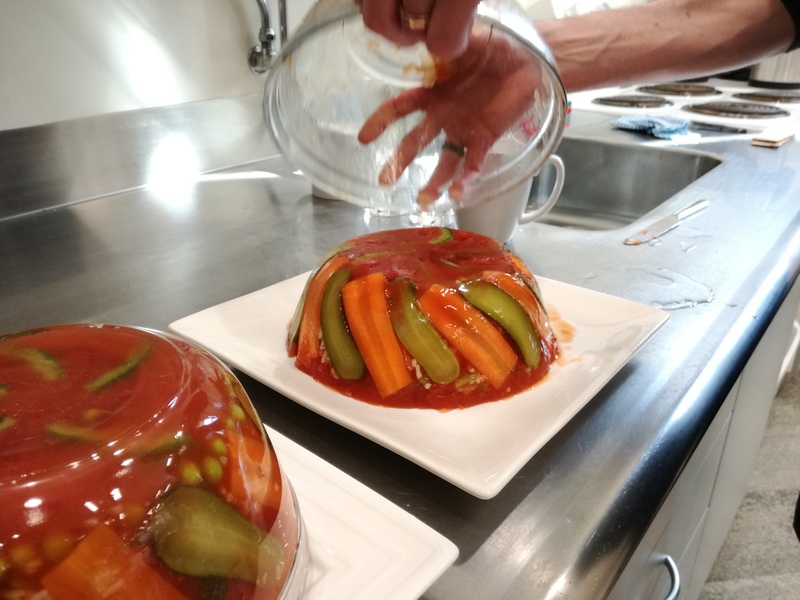 The day prior to cook day, I did a trial aspic, to get an idea of how it came together – had I converted pints to millilitres accurately? 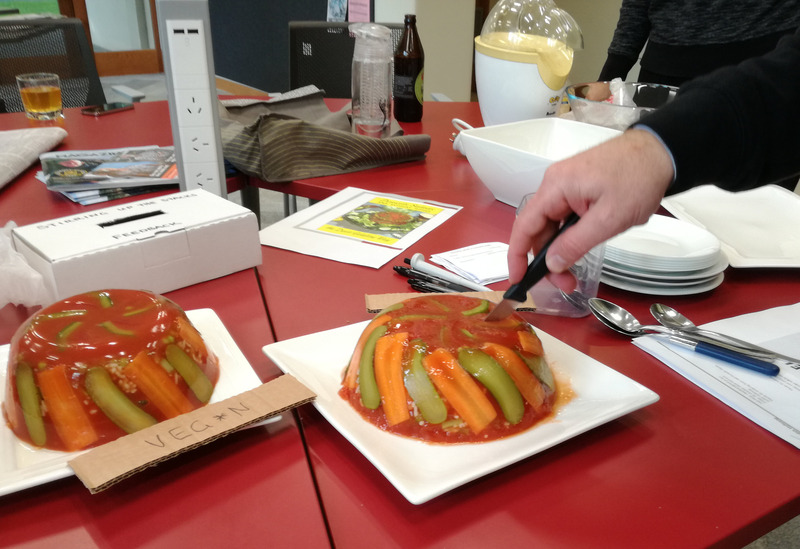 I also wanted to see if I could get the veges in the mould to behave as they should, to figure out how quickly the gelatine would set (the answer: forever), if there was enough liquid (there wasn’t – must double the mix come Show Day!) and if I could get it out of the mould. I’m an impatient one at the best of times, and tried too soon. 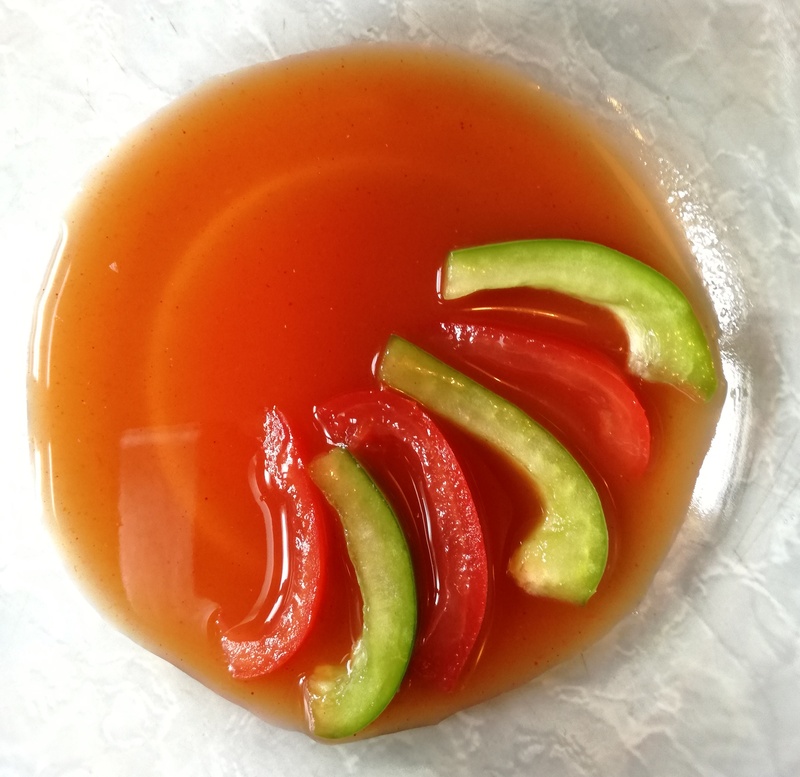 The tomato aspic, freshly tipped out of its bowl, cleaved itself as if it were the Red Sea. Lesson learned. Well, maybe. Leach and others have pointed to the time-consuming nature of this type of dish as one reason why it eventually fell out of favour. I’m not surprised to read this: as I was wielding my knife I was feeling certain that, were I transported back to the the 1960s as a housewife, I would not fare well in the role. I’m realising nor will I ever be a Michelin-starred chef. I’ve diced my vegies, cooked my peas and rice (rice?? ), and juiced the lemon that’s not listed in the ingredients but features in the method. It’s a hot day, I’ve got my first aspic brewing, and I’m knackered. Now things are getting tense. 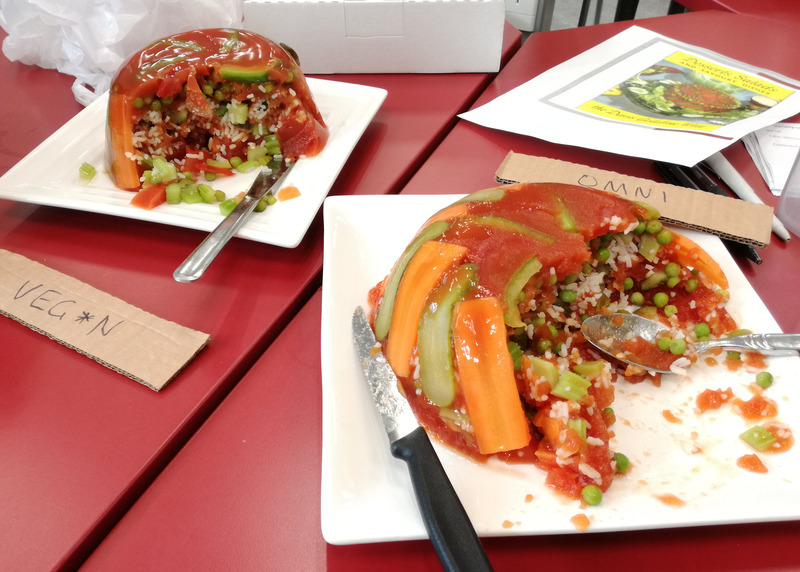 I have to pour a little aspic in my bowl, allow it to set a little, then artfully place my ‘garnish’ (slices of tomato and capsicum), then pour over a little more aspic. 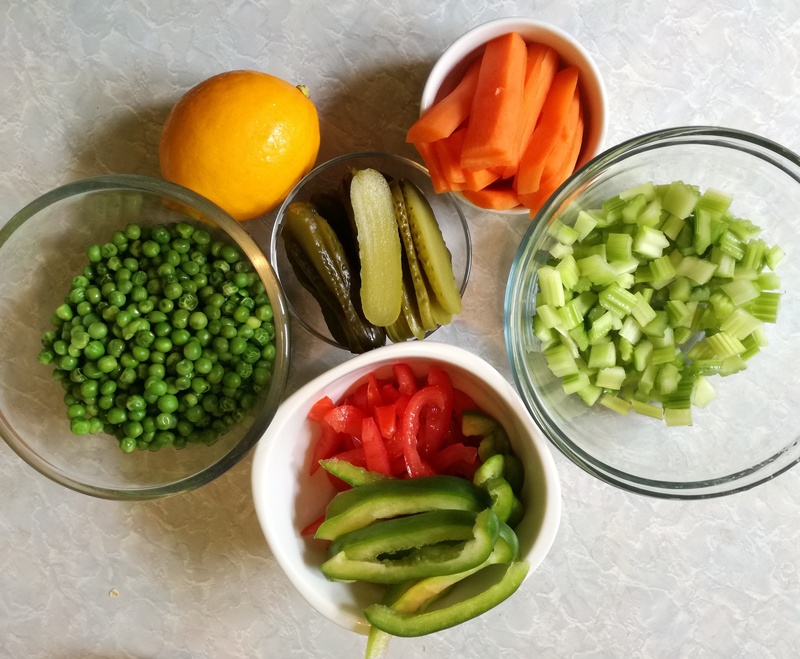 Time for the fiddly bit, the bit everyone wanted to know about – how did I get the gherkins and carrots to stay put? It’s a game of dip the strip (in partially set aspic), stick the strip (against the wall of the bowl at an angle), then repeat with the next. The fun continues as you discover half are falling off, and the others aren’t doing so well at staying parallel. Come half time, your language is becoming as colourful as the salad itself. Finally, I’m reasonably satisfied with the alignment, and the rest is plain sailing. On top of the peas, I pile the seasoned rice and diced celery. 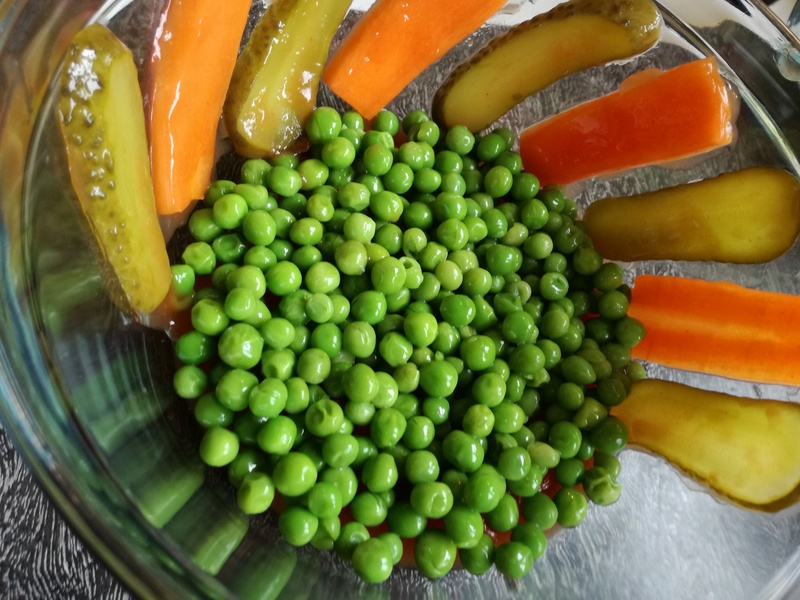 I have surplus carrot and gherkin, so in they go too. Once I’ve poured over the aspic, I’ll be done. But do I mix the aspic through the ‘variety’ mix? The instructions don’t specify, and I’m not sure there will be adequate seepage through to lower layers to avoid a rice eruption when I unmould. I give it a desultory stir, then leave it as it is. Come the big reveal, I’m nervous as. Will my salads unmould in one piece, and will anyone actually try any? It’s scary stuff. Ta da! The agar agar version, still in its bowl on the left, pleads with gravity to help it along. Meanwhile, the gelatine has held its own. To my great shock, both were persuaded fairly easily from their nests. The agar agar came out most cleanly, and had a beautiful sheen. It takes some time, though, to convince my workmates that they want to taste them. Archivist Tom eventually made the first move, and once he consumed a little and didn’t collapse, others tentatively followed suit. As we’ve learnt from reality cooking shows, nothing counts until the feedback is given. Tasters had the opportunity to submit their thoughts, anonymously or otherwise, and these, along with their facial expressions, gave me almost as much delight as the successful up-ending of my concoctions. The aforementioned Tom declared it to be ‘very surprising, & unexpectedly good’. Jacinta, Kaitiaki Mātauranga Māori, found it ‘delightfully refreshing’. Another said ‘very tasty once you get past the texture’. Emma (Collections Assistant, Publications), had textural misgivings too, saying ‘it is like eating tomato sauce as the main meal’. Jennie, also from Publications, thought it ‘visually splendid’, but noted ‘I don’t trust food that wobbles’. Understandable – I have similar reservations. Megan, a CA from Researcher Services deserves a special medal for summoning the courage to take the plunge, but said ‘I hope to never be that starving’. She was not a happy chappy. Others felt they’d been transported to the past – Archives Curator Anna said ‘just like Grandma used to make’. More than one staffer suggested the addition of vodka. Bloody Mary salad, anyone? 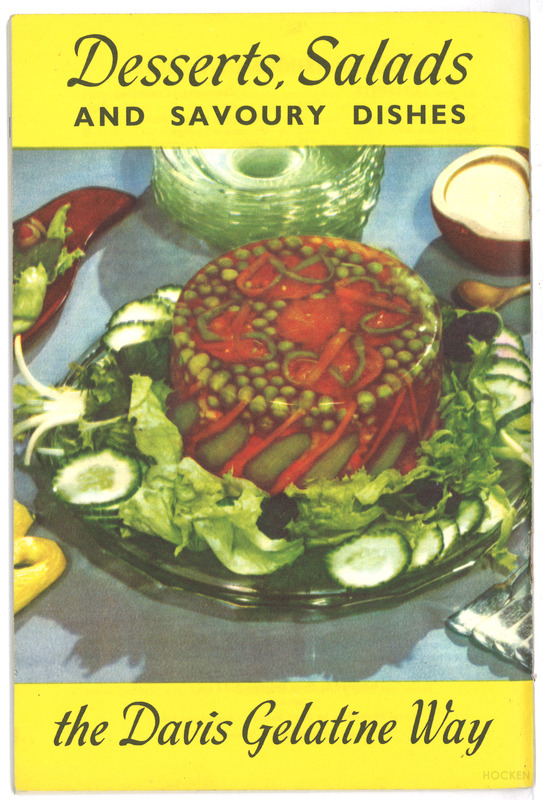 Publications Curator Pete summed it up for most of us though: ‘I can honestly say this is the best salad in aspic I have ever tasted’. And what did I think? It was a fun culinary experiment I probably wouldn’t repeat (I chose not to finish my serving), but it was far less horrific than I had imagined. General Assistant Nick takes the last word. He said ‘visually arresting, perfect for Christmas, delicious with Emerson’s Morning Star Pale Ale’. So, what are you waiting for – get it onto your menu for Christmas dinner. It’s sure to be a memorable dish. Leach, Helen. The Pavlova story : a slice of New Zealand’s culinary history. Dunedin, Otago University Press, 2008. 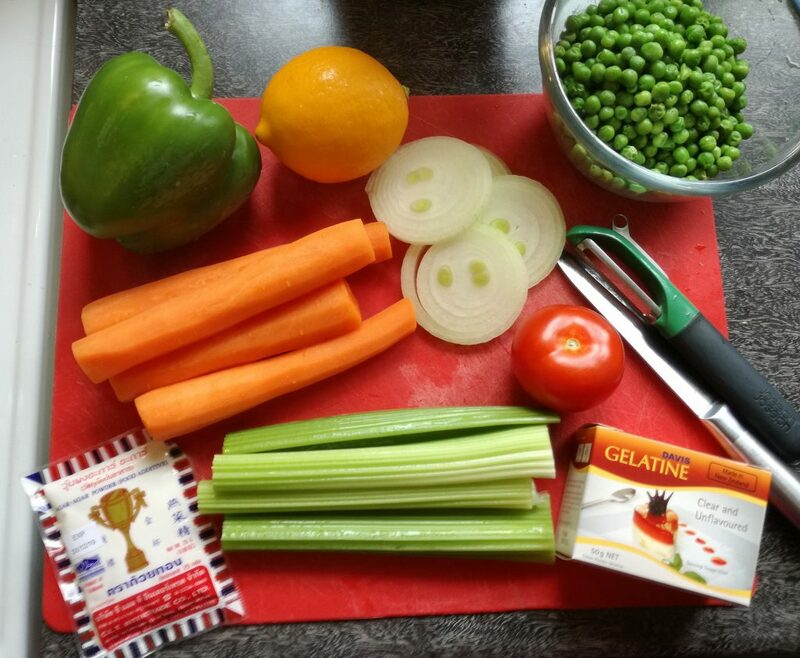 This entry was posted in Food and drink, Popular culture and tagged Stirring up the Stacks by Kari Wilson-Allan. Bookmark the permalink.